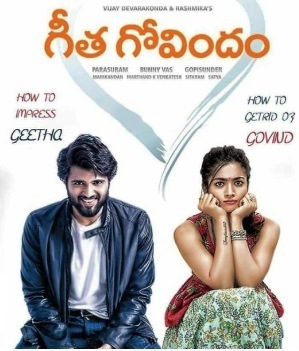 Geetha Govindam - A story about; a guy who fantasizes a happy married life with an obedient wife; but he himself is indulged in smoking and drinking daily, lying to his family; that trusts him undoubtedly, irresponsible and arrogant; and a girl who is caring and daring, strong and headstrong, playful and successful, considerate and concerned. These two characters meet and greet, love and hate, curse and date, each other and finally get married with the support of their families and a road-side well wisher, whose driver forgets to keep a stepney while going on a long journey, eventually tending in a happy ending. While this movie's songs are latest trending; movie makers should take utmost care while dealing with lyrics and songs, script and costumes, keeping in mind our epics and ethics; to avoid unnecessary controversies, although, probably controversy has become a new promotional funda of-late. The second half is better with the climax being the highlight, with the 'entry' of VK as a PG (prospective groom), that is late; but definitely twisting this movie's fate. A one-time watch, with one song easy to catch. Goodhachari (Spy) - A Good story, better screenplay, pleasantly surprising cast, with an after-effect to last. But for the fact that; this is a movie about an important government organization of the country, with its objectives as 'Infiltrate-Investigate-Inform' to safeguard the country; is itself so very vulnerable that it is being infiltrated so often by traitors/terrorists; this is a better 'SPY' movie of-late without any super-star(s). Though the emotion of a biological father is not so convincingly elevated when got mixed with a mission of mass destruction, the performances are apt to the characters; especially those of the 'Sp(ic)y-Girls' and the story with nice-twirls. Lead actor needs betterment both as an actor and a writer, though scores marks with looks and as a fighter. Overall, this is a stealthy block-buster and healthy idea in the industry which is recently lackluster.